Many pet parents are very much concerned about their dog health, especially when their furry companion is facing the problem of joint degenerative disease. Arthritis is one of the most common age-related issues in canines, which they suffer from. When your dog starts showing signs of joint problem such as reluctant to walk, run or jump on the furniture, it is obvious that he is suffering from arthritis. When your dog starts having this problem, you will be much more concerned about his health. Usually, a vet advises to keep him on joint supplements along with other treatment, which are very much useful and help him to recover and regain strength. Glucosamine and chondroitin are the most common supplements that most vets recommend. If you are still having a doubt whether this nutritional supplement is good for your pet or not then here we provide you the best source to clear your doubt. As per the discussion with our vet, here is the detailed excerpt on what he says about pet arthritis and what supplements you need to provide them in order to help them. Glucosamine and chondroitin are the two important products that are commonly used as joint supplements. These are not just used in dogs, but are also used for horses, cats and other animals and even humans are prescribed with these supplements. Dogs with joint problems such as arthritis or after surgery, they can benefit significantly from glucosamine oral treatment. The ingredient Glucosamine is an amino acid, which is a natural occurring substance in the body and plays an important role in forming and maintaining body tissues, particularly cartilage, ligaments and tendons. This component when formulated with another natural occurring ingredient chondroitin, helps in repairing damaged joint tissue. Apart from these supplements, there are other nutrients, which are essential for healthy skeletal system. Vitamin C and MSM are the other essential elements for cartilage repair. An effective joint supplement contains all the major nutrients combined and given as oral treatment in a powered form, liquid, tablet or chew is highly beneficial for dog health. These supplements are all safe with least to no possible side effects in pets. 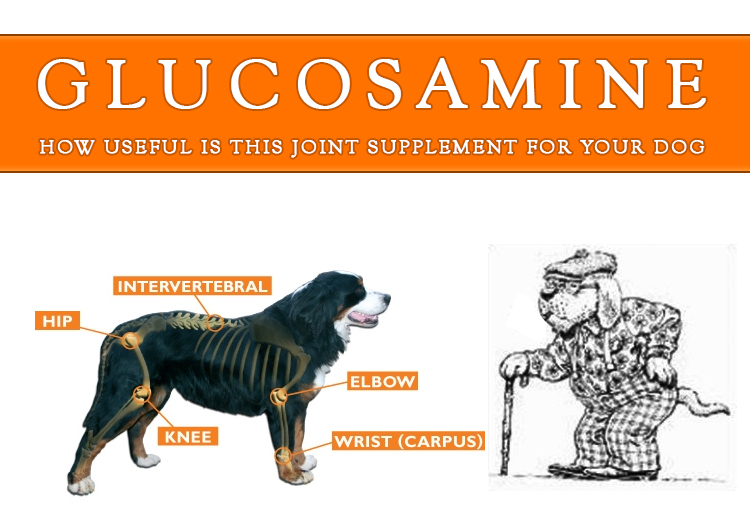 It is also safe to use Glucosamine for long term as it is generally used for degenerative joint disease, which can progress with time. It rarely happens that your dog shows signs of side effects due to this supplement such as vomiting or diarrhea. These signs develop for starting few days but recede eventually. If you find them initially, don’t worry but in case the symptoms run for the long time, it is good to show your vet. In order to minimize the side effects, it is always good to add this supplement in food and provide it. This will reduce any adverse effects. After the dog starts taking glucosamine supplement, it takes time to work up, build up and show effective results. Some dogs can show good improvement in arthritis symptoms within 10 days. It could take at least six weeks of time to see the benefit from the treatment in your dog. In fact, a dog once improving with this supplement should continue the treatment in a long run. These nutrients can also be given concurrently with other arthritis treatments such as anti-inflammatory medication. Well, your vet is your best advisor when it comes to which product or treatment you should have for your pet. « Pet Vaccinations – Unveil the Hidden Truth behind It!